Friends Farm received the “Commonwealth Quality Program (CQP) Innovator Award” from DAR Commissioner John Lebeaux. The award recognizes an entrepreneurial farm business that has entered their product into new and growing markets, sustained the core principles of CQP and established financial growth and expansion. From the outside, 2 Friends Farm resembles nothing more than a warehouse on a quiet street in Attleboro, inside, the urban farm is bustling with activity. 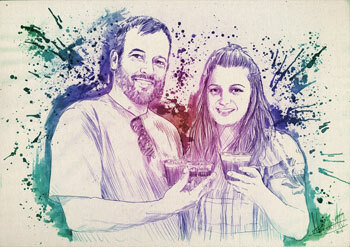 In 2013, Ashley Driscoll and John Irving got the idea to grow micro greens while searching for healthier food to eat. Daily, dedicated employees work planting, harvesting and sorting rows and rows of tiny nutrient dense micro greens. The “farm” space is large and open with plenty of windows, high ceilings, grow lights and trays and trays of delicious, thriving micro greens - immature plants harvested within about two weeks of sprouting that contain about five times more vitamins and carotenoids than mature vegetables. At 2 Friends Farm, things are done the old fashioned way: top quality seeds are densely sown in organic soil which provides all the nutrition these miniature plants need to flourish, resulting in a product that is packed full of superior amounts of vitamins C, K, E, lutein and beta-carotene than their mature versions. Grower Ashley Driscoll puts it bluntly; "We believe in giving people the most nutrient dense food. That's why we do what we do!" The demand for 2 Friends Farm micro greens is continually growing as people realize how healthy and tasty their products are. Initially starting with basic micro greens, baby greens and wheatgrass, they have expanded to growing arugula, beets, chard, herbs and many more delicious micro greens. They have created a line of salad and smoothie mixes that provide the basis of a meal, not just an accompaniment, as is typical of traditional micro green use. Their custom salad mixes can be dressed to taste and eaten as is, or mixed with other greens and accompaniments for a seriously nutritious meal. Visit their website for a list of where you can purchase their products.